Like millions of people, John Legere has seen loved ones bravely battle cancer, which is why he's on a $2 million mission to eradicate this disease. Will you join him? Outspoken, philanthropic T-Mobile CEO John Legere is hell-bent on finding a cure for cancer, a disease that affects so many of us and our loved ones across the country and around the world, including his own family and friends. Which is why, this holiday season, he’s teaming up with the Dana-Farber Cancer Institute in the #MatchtoConquerCancer campaign, where he’ll personally match donations, dollar for dollar, up to $1 million, through December 31, 2018. That would add up to a total of $2 million in funds that he knows first-hand, through his own work with Dana-Farber, will have an enormous, life-saving impact for so many. 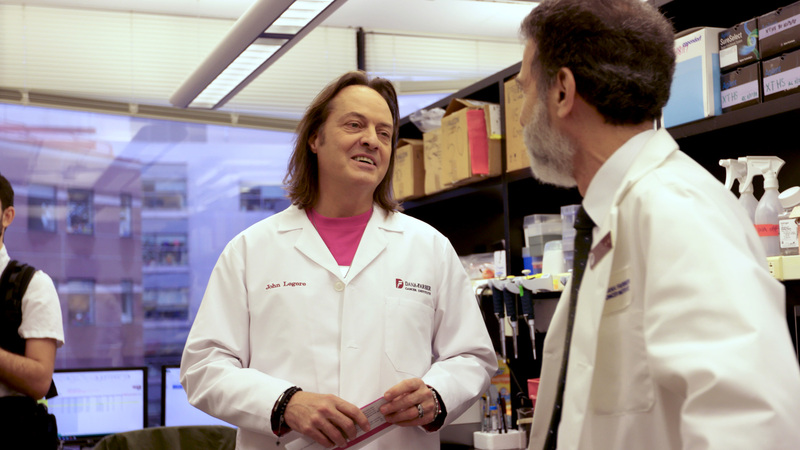 Dana-Farber oncologist Dr. Barrett Rollins talks to John Legere about the importance of the genetic research he and his team are conducting in the fight to cure cancer. Dana-Farber’s breakthroughs on Profile—a tumor genome mapping project—are helping doctors treat their patients in a more precise way and helping scientists better understand why cancers behave the way they do. Profile provides the genetic signature of each person’s disease, which allows doctors to deliver drugs designed to target the specific mutations causing cancer to grow. The result is more effective treatment with fewer side effects. Legere strongly believes that a lack of resources should never stand in the way of cancer research, which is why he’s so committed to doing something about it. Will you join him?